It’s easy enough to make a product look good and perform miracles in the closed environment of a demonstration room, but when installing a security system, one often has the concern whether the products you purchase will perform effectively once out in the real world. In the controlled environment of the demonstration, systems are set up in near perfect conditions, but once installed on your site they have to deal with changing lighting conditions, weather changes, user carelessness and a host of other problems. A large organisation planned to implement an integrated security solution that would need to function effectively in all ‘real-world’ conditions. Through their consultant, a number of products were pre-screened and selected for the job. Before making the final decision, however, to ensure the systems would function as required and also as an integrated whole, the consultant and the customer retained the services of Ernst Le Roux from EtrOniTech to organise a ‘runout’ to take place over a week. EtrOniTech is an integrated security technology auditing service provider offering full evaluation and auditing services for electronic security systems, from project initiation to post-installation work. In co-operation with consultants, contractors, system integrators and end users, the company provides the assurance that installed solutions meet the client’s expectations. For the runout, all the products selected by the customer would be installed and integrated into a central management platform at a location in Johannesburg. The product suppliers had two days to get their systems up and running, and integrated before the testing began. After this, the customer and some invited guests would visit the site and see the systems in operation. To ensure a level playing field, the customer was not made known to the participants. Data Connectivity Solutions (DCS) supplied the communications backbone for the runout as well as a switch that would allow all the participants to integrate their solutions to the management platform. Willie Le Roux, a director of DCS said this backbone would form the foundation of the integration exercise and DCS made sure communications were not a hindrance to any of the solutions at the runout. The company also remained on site to ensure the network functioned optimally throughout the week. As noted above, the runout was not a competitive exercise to see which vendor delivered the best product. The customer had already decided on the products they wanted based on their advertised capabilities as well as existing systems already in place. While the customer wanted to install a range of new products, the site already had many security products installed, dispersed over various buildings, including fire safety systems, alarms, generators and UPSs. The plan was to make use of the existing products as much as possible and integrate the new and the old. Because of the variety of systems that the customer wanted to manage centrally, a single management platform was required that was able to integrate all the systems effectively. Moreover, if a chosen product was not automatically integrated, the platform needed to have the ability to quickly integrate it without unnecessary delays to the problem of getting a vendor to develop new software. IoT.nxt was selected as the management platform. The company provides a management framework that makes it easy to integrate almost anything electronic and manage it. 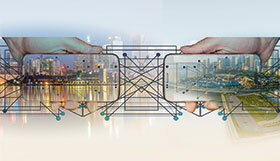 IoT.nxt’s Waldo Viviers says the strength of the framework is that it is technology agnostic, which simplifies the challenges of connecting devices or systems. IoT.nxt’s Raptor is the primary solution deployed to ensure the easy connection of products (even older products not designed with integration standards in mind) to the management framework. The framework is not restricted to security products and systems, but can include “almost anything electronic”. This made IoT.nxt a good solution for the customer who wanted to manage more than simply the latest security equipment. Viviers explains that the system was already able to integrate many of the security systems the customer used, and that integrating the rest was simple because of the way in which the platform is designed. He says the new version of IoT.nxt (version 3), makes it possible to integrate new products “almost seamlessly”, allowing for entire sites to be set up in a few days. The management framework does more than simply allow for all the integrated systems to be viewed and managed from a central console. Viviers says it also contextualises the data to allow for more efficient management. For example, using licence plate recognition (LPR), the system can be used to track a security vehicle around the site, providing real-time information on where the patrols are. If something is amiss, the system can raise an alert and management is empowered to deal with the situation immediately. The same applies to other systems. If a fire alarm goes off, surveillance cameras can be focused on the site of the alarm to provide a clear view of what is happening while the access control integration can make sure that all doors are unlocked so that people can escape. The customer’s generators and UPS systems can also be monitored to ensure they are in working order at all times and don’t, for example, run out of fuel when Eskom goes dark. When it came to access control and surveillance, the customer was not only concerned with purchasing reliable and proven products, they also wanted to be sure that the vendors were able to provide local support for when something broke or needed an upgrade. To facilitate this, local company Saflec and New Zealand’s Gallagher were chosen to handle the access control aspect of the runout, while Avigilon was selected as the surveillance camera of choice. The capabilities of Gallagher ensured that it could be used for more than access control. Using the features the system provides, perimeter and building management functionality could also be included in the final solution and incorporated into the management platform. Saflec was able to demonstrate the effectiveness of its access systems, including its metal detectors and its Bluetooth/NFC mobile integration. One of the benefits of both Saflec and Gallagher is that both are able to integrate with SALTO locks as well as ViRDI and Idemia biometric products, all of which the customer already has on site. The customer selected Avigilon cameras since it already has products installed. What impressed the most about Avigilon’s new cameras during the runout, however, was its latest video analytics functionality. Avigilon SA’s Charntel Loftus says the company’s latest thermal camera, which was being demonstrated at the runout, is able to pick up a person at 220 metres. This is more than merely motion detection as the analytics will identify the object as a person (versus an animal or vehicle) and then highlight it on the screen for operators to observe or take action. Avigilon also had its latest PTZ products set up and was able to demonstrate its adaptive IR PTZ. Adaptive IR means the Infrared lighting adapts to the distance at which an object is being viewed. Designed for providing IR capabilities at up to 250 m, the IR lighting changes as the operator zooms in to ensure you always get the clearest image, whether the object is 10 m or 200 m away. Traditional IR can flood the area under observation with too much or too little light depending on the zoom and the distance. The visual cameras at the runout were tested against Rotakin targets (specified in BSI EN 50132-7:1996 to test CCTV camera performance), applied in the country by EtrOniTech, to determine the quality of resolution, latency, depth of focus, lens distortion as well colour distortion among other tests. Loftus adds that the company was also able to show its integration capabilities with both Gallagher and Saflec, as well as IoT.nxt. Avigilon has an SDK (software development kit) available to assist other companies to more easily complete the integration of Avigilon into their products. The runout also gave the Cobra Fire Izigi First Response Unit a chance to prove its worth in the firefighting field. The unit was deployed to put out a fire (which was set for this purpose), while under the watchful eye of the visitors and the cameras. Despite the complexity of integrating so many products (there were more products on site than mentioned here to ensure the integration between old and new would be as seamless as possible), the set-up was completed in the two-day timeframe and testing was done throughout the rest of the week. Tests were run during the day and at night to assure the customer that the system would deliver value no matter what the lighting situation was or what the weather decided to do. EtrOniTech’s Le Roux was happy with the runout as a whole and was able to write a complementary report for the customer about the products and services offered by the vendors. He says that apart from the customer, around 80 invited guests attended the runout at various times of the day (some more than once), to see the systems in action, speak to the various vendors, and determine whether the products on show were suitable for their specific requirements. The Fibaro System an advanced intelligent home automation solution making use of micro-modules to make it compatible with almost all electrical systems.